DALLAS, March 19, 2018 /PRNewswire/ — We, Chili’s® Grill & Bar, just made things a whole lot simpler for Guests participating in our loyalty program, My Chili’s Rewards. Have you noticed that loyalty programs have turned into crazy math equations? Like, let me calculate how many points I’ve earned. But, the rate of earning isn’t even clear. Then, let me solve to understand what the heck that means I get in return for keeping track of all of these points! Well, starting today, we’re breaking away from the norm and promise that you don’t need to solve equations to know what you’re getting as a My Chili’s Rewards Guest. It’s simple! 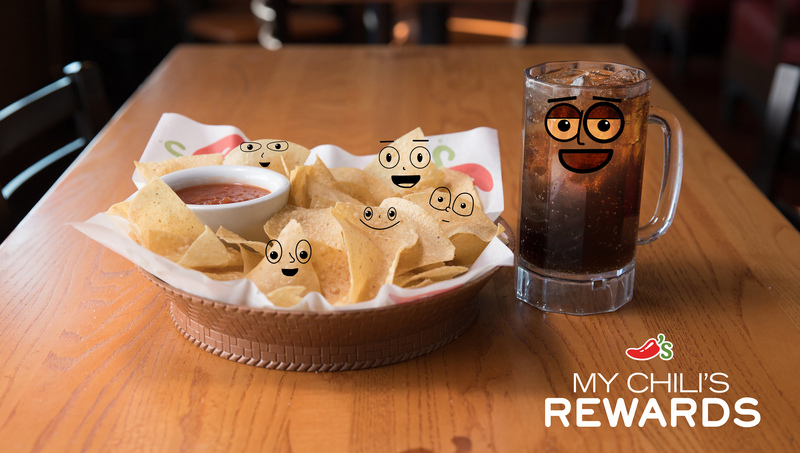 My Chili’s Rewards Guests will get their choice of chips and salsa or a non-alcoholic beverage during every (yes, every) visit to Chili’s. "It’s raining chips, hallelujah, it’s raining chips!" sang Steve Provost, chief marketing and innovation officer of Chili’s. "Well, and free non-alcoholic beverages!" But, how did we come to this marvelous and simple update to our loyalty program you ask? By taking the time to listen to our Guests. We heard the feedback loud and clear that loyalty programs feel too complicated so what would keep them coming back is to make things simple. We then took that and tested it in a few markets starting in August 2017 to confirm we were giving Guests what they want. The results? We are! In test markets, approximately 50 percent of My Chili’s Rewards members opt for free chips and salsa and the other 50 percent choose a non-alcoholic beverage. "The reality is a loyalty program is a way of saying ‘thank you’ to our Guests for being one of their top dining options and we weren’t doing a good job of that until now," added Steve Provost. If you’ve lost faith in loyalty programs over the years, we’re delighted to share Chili’s is giving you a reason to care again. Join My Chili’s Rewards at https://www.chilis.com/rewards and experience the simplicity yourself.